Acquired Book By: I was selected to be a part of the blog tour for “Yellow-billed Magpie” hosted by iRead Book Tours. I received a complimentary copy of the book direct from the author Nancy Schoellkopf in exchange for an honest review. I did not receive compensation for my opinions or thoughts shared herein. I like novels which ask questions of it’s readers inasmuch as a story whose heart is aching for a reader to dig a bit deeper than the superficial level of insight. I like finding novelists who write a story with it’s own uniqueness to where it cannot be measured against another novel; for it’s originality sets it apart. I like finding authors who are daring in their courage to tell stories other writers might not feel they can write as eloquently but I appreciate all writers who strive towards pushing themselves past their own set of comfort zones. 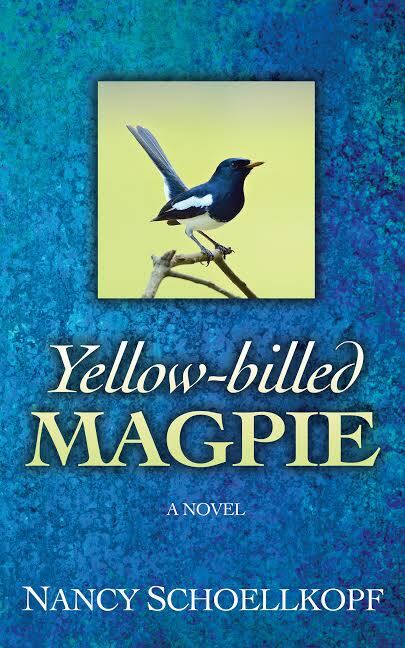 I was enthralled with the idea behind Yellow-billed Magpie by the title and then the synopsis. Generally titles may or may not sway me one way or the other; usually because until you sit down with a novel, the title is a bit elusive in explaining itself to you. A synopsis is only a short breath of a clue to what a novel could speak to you about as you read it, but it’s a hint of a suggestion nonetheless. For book bloggers and reviewers (like myself) the synopsis either wins us over in curiosity or we might take a pass on a title until lateron down the road. In this instance, I was finding myself enjoying the pleasure of seeking out Indie Writers and/or Self Published Writers who were happily giving me a story-line which did not feel repetitive nor re-invented. I like finding writers whose stories tend to stand out from the pack and give you a character who might stay with you longer than the time it takes to read their story. All novels effect us in different ways, some even flutter back inside our memories at later dates – randomly overtaking our thoughts. I like seeking out the stories which give me something to chew on and give me a hearty story to appreciate as I read the words their author left behind for me to find. I was hoping this might be one I would find I couldn’t quite put down without gratitude for taking a chance on it’s author’s style. Nancy Schoellkopf has been telling stories and writing poems for many lifetimes. It goes without saying she’s needed a second income, so this time around she happily taught amazing children in special education classes in two urban school districts in Sacramento, California. A full time writer now, she enjoys lavishing attention on her cat, her garden and her intriguing circle of family and friends.